Overview Students will follow and implement a beginner level java-based Test Driven Development (TDD) approach with JUnit in the Eclipse IDE. First, they create a test case that fails, then they start creating mock code, and finally a simple piece of code that allows their test to pass. It is assumed, as per the prerequisites above, that students have already learned about TDD. However, if teacher or students need some content to start on, the best quick dummies guide would be this YouTube video summarizing TDD, and this graphical explanation of the TDD process. If you want more extensive TDD learning content, check out Kent Becks "Test-Driven Development by Example". He is the inventor of TDD and wrote JUnit, the focus of this exercise. Additionally, see how a CalPoly and College of Charleston class used TDD in their studies. For more resources, and ideas on secondary TDD exercises, see the Appendix of this page. The method of how developers go about implementing code is varied. Test driven development is one such method stemming in the 2000's that has gained momentum as an accepted and research-proven method for increasing software quality, readability, and reliability. Testing software to assure that it works within particular constraints is an extension of quality assurance (QA) efforts that most professional software products enact to increase their products value. With TDD, this testing is built-in even before students write their first line of code. This means that students will have a better grasp on what they are programming and why. It means that students will have code that not only works when they first implement it, but that will continue to work when others develop next to it and run the same tests. This activity follows a tutorial that steps you through the TDD development process in the Eclipse IDE using its integrated JUnit module. Follow the below tutorials while implementing the TDD test code in Eclipse on your own computer. Finally, you will create standard functional code that gets the tests to succeed (green JUnit bar). You will hand in this code, the associated test code, and two screenshots. First, you will need to setup and understand your coding environment. If you have not setup the Eclipse IDE for java before, read through some of the below links. You need to be able to run code and tests with the IDE. There can be some unexpected "gotchas". Download and install Eclipse - JUnit comes with "Eclipse IDE for Java Developers"
Become familiar with the Eclipse Workbench and in Running code - there is a built-in Eclipse Help Guide, as well as 3rd party tutorials. 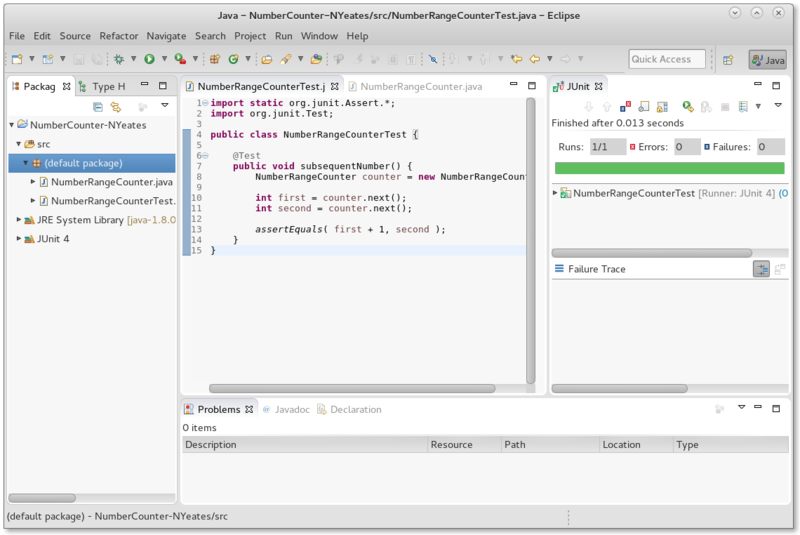 Watch How to Create and Run a Simple JUnit test in Eclipse IDE. Try the tips in the Comments section below if you get really stuck. Start a new Java Project and include your own name in the 'Project name' field. It is an illustrated step-by-step walk through of creating a test and then creating the associated System Under Test (SUT) code (the code which implements the functionality that you actually want). Create a file called "NumberRangeCounterTest.java" to put the test code into. Create a separate file called "NumberRangeCounter.java" to put the skeleton SUT code into. Implement the test class code and the skeleton SUT code found in the tutorial and get a failing test. You will be marked up for commenting your code. Take a screenshot of the failing test (red JUnit bar) and code. You should now have a test case that fails and a stub/skeleton for the System Under Test (SUT) code. Now, you need to make the test succeed. This means implementing the SUT code (the code that actually implements the functionality wanted) to make the test go green in Eclipse. Create working SUT code in the "NumberRangeCounter.java" file. Take a screenshot of the succeeding test (green JUnit bar), alongside the code implemented to attain it. Test code and implementation (SUT) code that, together, make a successful test case (green in Eclipse JUnit). A screenshot of the test failing (red JUnit bard), before you write the SUT code. A screenshot of the test succeeding (green JUnit bar), along side the code you just ran. Note: You may not use the screenshots provided in the tutorial, as that would be plagiarism. Provide full-screen shots that include the entire Eclipse work space. Show students any unit testing or TDD-based development you may already have in place. A real life example, with an explanation from a community developer would be a perfect way to solidify the understanding that testing is necessary for real world software. The below appendix includes information found while researching and creating the above Learning Activity. Instructors may find it useful if they are wanting to create their own follow-on activities or want more info. Below lists 3rd party tutorials, how-to's, and learning resources that explain TDD and JUnit. They may be useful as alternative or harder secondary learning activities so that students can dive in a bit deeper. This is the tutorial used in the above activity, kept here for posterity sake. License says "This material may NOT be used as course material without prior written agreement." The below list shows actual open source projects that were created with TDD methodologies. These could be used as examples of TDD in-practice. Students could learn how TDD is done in real life, learn best practices, etc. They are divided below into the two best examples, and then a number of other weaker examples. Superb write up by SQLite of how they do extensive testing, but its possibly not developed with TDD principles, or maybe partially. Jim Bowring has done this in the past, though it seems they are lengthy projects vs a shorter activity; Do we want to create a “project”-oriented LA? How can we test a Requirement?